The cobblestoned, always-buzzing village is impossible to resist. There's no such thing as too much of this view. It's up on the rooftop, hidden away from the street-level hustle and bustle. Once there are a few kids' blankies and books scattered around, it'll feel even more like the real deal. No need to rush through breakfast, Whistler Village Gondola and Fitzsimmons Express Lift are just steps away. You can sleep in longer, this resort has ski-in/ski-out access. Switch up your après ski spot with a visit to Downtown Whistler, a 6 minute walk from the resort. Brave the brisk temps on the way to the rooftop hot tub. Toss snacks in a backpack and head out for the 4 minute drive to Blackcomb Trail. Take a break from the slopes and work on perfecting your swing. The resort is a 6 minute walk from Whistler Golf Club Driving Range. Adjacent to the Whistler Blackcomb gondolas, Sundial Boutique Hotel gives guests a head start – a huge perk for fans of first tracks. You’ll be up top before most skiers have boarded their shuttles or found parking. Want to speed the process up even more? Pre-order lift tickets and line up rentals from Affinity Sports next door (open until 10:00 PM in winter). Then that first morning, stop by the ski storage area off the lobby to pick up your gear, and you’re peak-bound in minutes. The only owner-operated hotel in Whistler, Sundial is also home of the only rooftop hot tub in the village. Time it just right and you’ll get amazing sunset views of Alpenglow, especially incredible in the winter months when the colors reflect off the snow. Summer guests have access to the outdoor pool at the Mountainside Lodge nearby, a trump card you can play if the kids panic when they realize there’s no pool onsite. Even if you plan to make most meals in, you’ll want to switch it up a few nights with the onsite Mexican Corner, Sushi Village and Black’s Restaurant & Pub, popular with the locals (and who can argue with the locals?). Settle into your one bedroom suite, then let a quick game of Paper, Rock, Scissors determine who gets which bed. Perks like daily room cleaning, heated slate bathroom floors and AVEDA bath amenities are just a few of the reasons guests keep coming back. The full kitchen is begging for big-breakfast making, and easy, filling dinners. And the mountain and village/valley views from the living room windows are equally spectacular in their own way. Wind down before bed with a mini movie marathon. Let the sofa-bed sleepers choose the movies (since you’re all currently crashing in their space), flip on the fireplace, pop a bowl of popcorn and get the party started. 24-hour access to concierge services could be your best secret travel-planning weapon yet. Tap into their local expertise for tips on booking the best excursions. The options are mind-boggling, so it’ll take some skills to cram it all in. 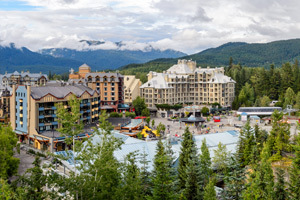 Host resort for the 2010 Winter Olympic Games, and named the #1 Overall Resort by SKI Magazine, Whistler Blackcomb is a home run for winter activities, from snowmobiling to ice climbing. Plan a sleigh ride dinner, or go see the weekly fireworks and insane feats of skiing/snowboarding at the Fire & Ice show. Summer is ideal for golfing at Whistler Golf Club, Nicklaus North, Fairmont Chateau and Big Sky. The five nearby lakes are incredible as well – kayak, canoe or just hang out on the beach. Send the thrill seekers bungee jumping while everyone else goes for a hike or bike ride, then regroup for a trip across the two mountains on the Peak 2 Peak Gondola, which links Whistler Mountain’s Roadhouse Lodge with Blackcomb’s Rendezvous Restaurant. - All guests must be at least age 25 or accompanied by a parent or official guardian. For more details, please contact the office using the information on the reservation confirmation received after booking.